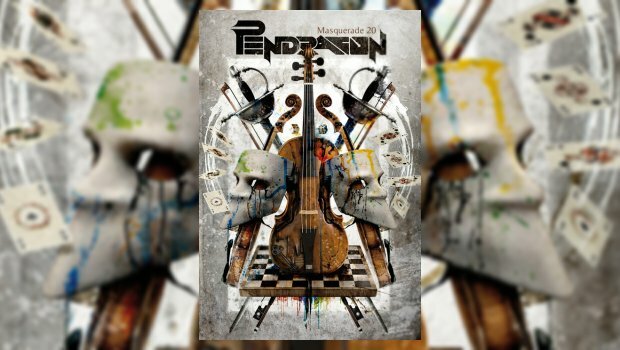 In 2016, Pendragon marked the 20th anniversary of their most successful albums – and one of their most loved – The Masquerade Overture, with a tour, recently releasing the Masquerade 20 live DVD, filmed in Katowice in Poland before an enthusiastic crowd. It’s a fine way to document the excellent live show of this experienced rock band in full flow. The first half of the show is a performance of The Masquerade Overture album in its entirety, and one can understand why the album appeals to so many as it’s chock full of great tunes like Paintbox, Guardian of My Soul and Masters of Illusion. These Prog classics are all played with fine musicianship from a skilled band, and stellar guitar work throughout by Nick Barrett. Pendragon choose to more or less play the album straight as originally recorded. Not only does this allow them to showcase some of their strongest songs, but also to air less well known songs which have probably only rarely been played live, if at all, such as the multi-faceted tragedy of The Shadow and the folk-tinged The Pursuit of Excellence. The production values on this release are excellent, particularly the sound which is crisp and clear, really giving a feeling of the live sound in the arena (not something which can be said for all live DVDs!) Barrett’s incisive guitar sounds cut a very clear and sparkling path across the speakers throughout the concert. The camera work achieves that balance of giving the viewers a close up perspective on the band at times, but without feeling claustrophobic. 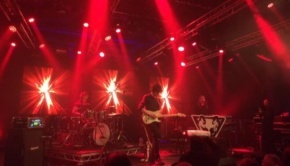 There are plenty of wider stage shots so that one has a sense of what the crowd were witnessing, with the added privilege of seeing close up Clive Nolan’s fluid keyboard work, most notably on Paintbox, or Barrett’s outstanding fretwork. The DVD extras are limited to an unremarkable but amusing video of the song Bardo, apparently filmed when Barrett was on holiday. There is also a short interview with drummer Jan-Vincent Velazco and, mainly, bassist Peter Gee, who reveals some interesting insights into the history of the band, which will not be shared in this review – no plot spoilers here! Pendragon also play some more obscure tracks associated with The Masquerade Overture in King of the Castle and Schizo, originally only released on a limited edition CD bonus disc. These are interesting excursions into the lesser known recesses of Pendragon. Christina Booth of Magenta with Verity Smith on backing vocals come to the fore in great fashion on the largely acoustic King of the Castle with some beautiful and dramatic vocalisations, singing as instruments themselves. Nick Barrett is the centre of attention for the great majority of the show, with most eyes on his incredible guitar work, but he is also on good form vocally, particularly on the heroic sounding Masters of Illusion. 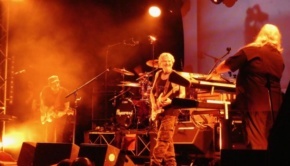 What is also notable is that this is a band which is clearly enjoying themselves with Barrett literally bouncing along with Paintbox, bantering with Clive Nolan and having fun with Peter Gee – his two longest serving bandmates in Pendragon. Barrett is a man of few words between songs (thankfully when it comes to his attempts at some Polish!) but when he does speak with the audience he does so with warmth and sincerity. 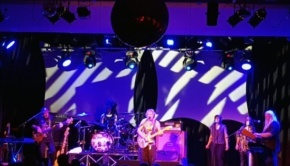 The second half of the show is an altogether different affair after the pomp of The Masquerade Overture as Pendragon play some more recent songs, including their most recent studio album Men Who Climb Mountain, a much more reflective and personal album for Barrett. Beautiful Soul comes across very powerfully and Faces of Light positively radiates, both songs enhanced greatly in a live setting. Nostradamus is a real highlight of the show, bouncing along joyfully with a chorus the whole crowd can join – short, sweet and glorious. In contrast the much lengthier and more sombre Explorers of the Infinite does rather deflate the atmosphere, even if this tribute to ‘those that really push boundaries’ and its litany of explorers is a noble aspiration. Barrett continues his more personal perspective with a strong song dedicated to his father, Come Home Jack. This is also one of the few songs to have added special visual elements with the words ‘Anomaly’, ‘Exorior’ and ‘Memorium’ superimposed across the screen in an interesting effect. Earlier in the show childhood images are similarly projected over As Good as Gold, but such touches are rare and restrained – the real focus is on the band and their performance. This Green and Pleasant Land is an impressive tour de force highlight of the show with Barrett relating to the experiences of his older relatives in war time, and his sometimes scathing views on modern society. His guitar work is grungier and more akin to U2 than more mainstream progressive rock licks. New drummer Velazco is particularly impressive, and Clive Nolan plays his revolving keyboards in spectacular style at this epic’s conclusion. Bassist Peter Gee is rather an unsung hero as he lays down a very solid bass whilst also switching to acoustic guitar and even a little on keyboards throughout the show. A scintillating Indigo from arguably one of their best albums, Pure (which seemed to mark rather a rebirth of the band in a more modern progressive a few years ago rather than a more traditional ‘Prog’ style), wraps up the show in stark contrast to the more majestic The Masquerade Overture. 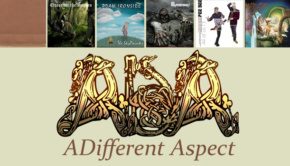 This contrast shows the two faces of Pendragon – the earlier band with deep roots in ‘Prog’, owing great debts to Pink Floyd, Camel and Genesis; and the much later incarnation which modernised itself and added a more angular, sharper edge with a more personalised lyrical angle. Fans of different eras will prefer different manifestations, but what ALL Pendragon fans will agree upon is that the undoubted highlight of this whole live DVD, and an abiding personal memory having seen them at HRH Prog earlier this year, is the absolutely blinding guitar solo Barrett plays on Breaking the Spell. This fluent, soaring solo which Barrett takes ever more stratospherically just when you think it’s coming to an end was utterly spell binding to see live and is simply stunning on this DVD – alone worth the price of Masquerade 20 – I almost got off my sofa and applauded all over again just watching it on my TV – it’s that good!